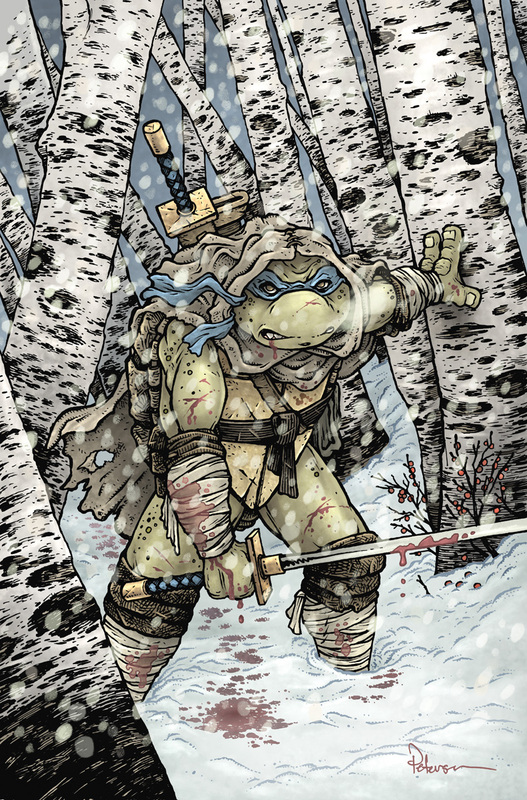 This is my third Teenage Mutant Ninja Turtles Macro series cover for IDW, and it features Leonardo. Originally the order of the turtles' macro series was different, and Leo was last, but a scheduling switch at the publisher gets Leo ahead of Raph. 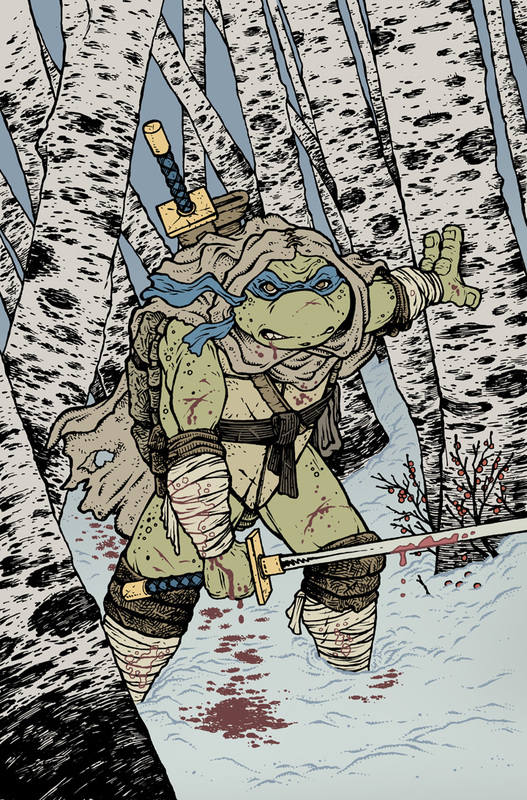 You can see my previous TMNT covers here. To the left is the finished art for the cover, and below in this blogpost, I'll go through the various steps to create the final piece. The first step was to come up with what the cover was going to be about. 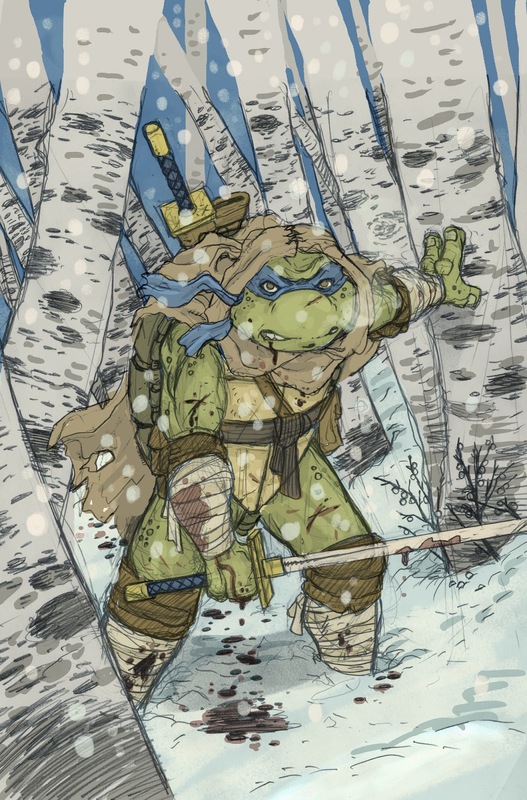 In the issue, Leo does have a battle in the woods, and though my version isn't as it happens in the issue, it felt like a way to explore Leo in a more aggressive posture while also paying homage to some old Eastman & Laird drawn story notes. The color, snow and breath were digitally done to help me see the piece as a layout, but also for my editor Bobby as well as the license holders, Nickelodeon so everyone understood what the final art was going to resemble. With the layout approved, I started inking the cover. I printed out the above digital composite layout and taped that to the back of a sheet of Strathmore 300 series bristol. On my lightpad I'm able to see through the surface of the bristol down to the printout to use as a pencils guide as I ink. For pens I used Copic Multiliners (my pens of choice). Here I used mostly a 0.7 other than a few details where I went down to a 0.3 nib. Texture and hatching is very important to me, and I focused it here on the gear Leo is wearing as well as all those birch trees. Once the inks were approved I could start on the coloring process. The first step of that is to 'flat' the piece by adding flat colors to establish the color areas...that Leo's hood is a different color than his bandanna, or his forearm wraps, or the sky, etc. I happened to use colors very close to my final piece, but I could have used any colors at this stage, purple skin, orange bandana, navy sky...it's just all about coloring within the lines so that it's easy to re-isolate those areas again when rendering. In this step I also defined all the color holds, areas I wanted the inkwork to be a color other than black: The snow & the blood. The final step is to do all of that rendering. Adding light and shadow and texture. I do this with the dodge and burn tools in Photoshop and a stock brush. For the falling snow I pulled out my rarely used Wacom tablet to paint in some digital snow. In Mouse Guard I've always inked dots on a separate sheet of paper, but I find that creates something a bit too graphic and hard edged. Painting digitally, I was also able to add in the breath coming out of Leo's mouth. 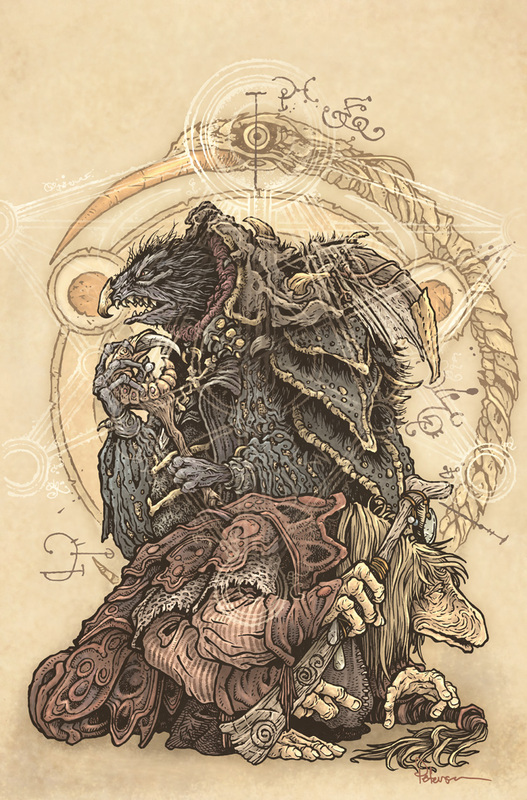 This is my third variant cover for the new Dark Crystal series from Archaia titled "Beneath the Dark Crystal". You can view my past two covers here. 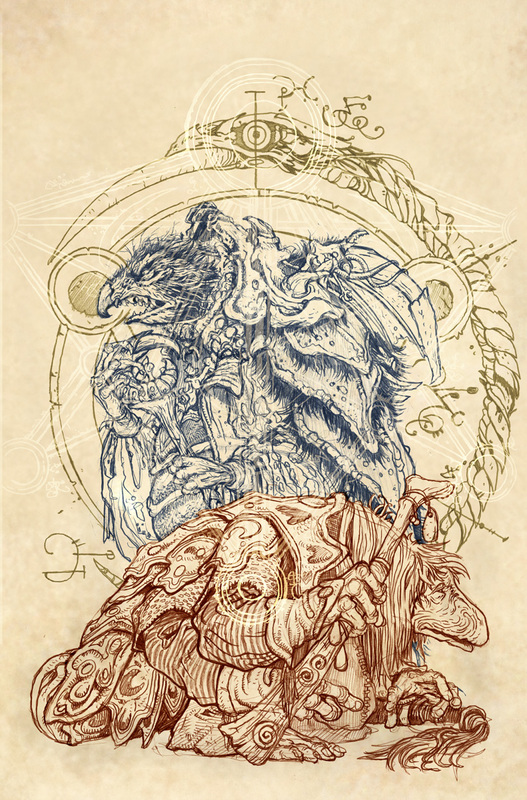 This cover features UrIm the healer (mystic) and skekUng the Garthim Master (Skeksis). To the left you can see the finished cover art and below I go step by step to show how I created the piece. I started with pencil drawings on copy paper. I am fortunate enough to have several folders of reference photos from various angles of the Mystics and Skeksis from Henson. Those are invaluable as I'm drawing the figures and trying to decipher details of their clothing and anatomy. 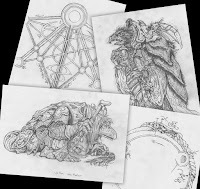 For the background image as well as the overlayed ghostly design, I am using existing Brian Froud imagery from the Art Of The Dark Crystal book and then recreating it in my linework. I scan each piece of paper to create the layout to submit for approval. Having the drawings all scanned separately allows me to color tint each figure and then independently move them around until I like the placement of the characters in relationship to the background and the pattern overlay. The Garthim Master's head needed a little adjustment too. So in this step I was able to cut it and rotate it to where it looked better. 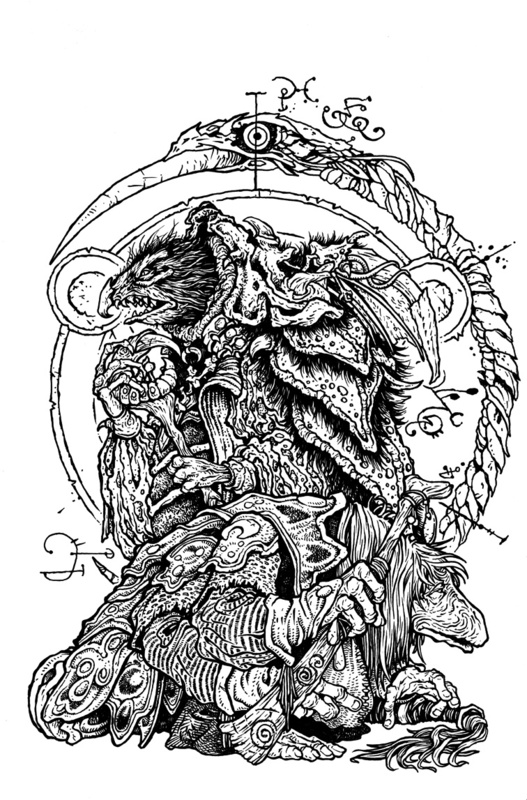 Speaking of the Garthim Master, I think not only is most of his armor made of Garthim carapace, but that the 'webbing' on his back is actually a female Gelfling's wing fragment. Once the above layout was approved I was able to ink the piece. I printed out the layout and taped it to the back of a sheet of Strathmore 300 series bristol. On my lightpad, I can see through the surface of the bristol and use the printout as a pencil guide to ink from. For pens I prefer to use Copic Multiliners. I mostly use the 0.7 nib, but there were certainly spots on their faces where I used a smaller 0.3 nib. 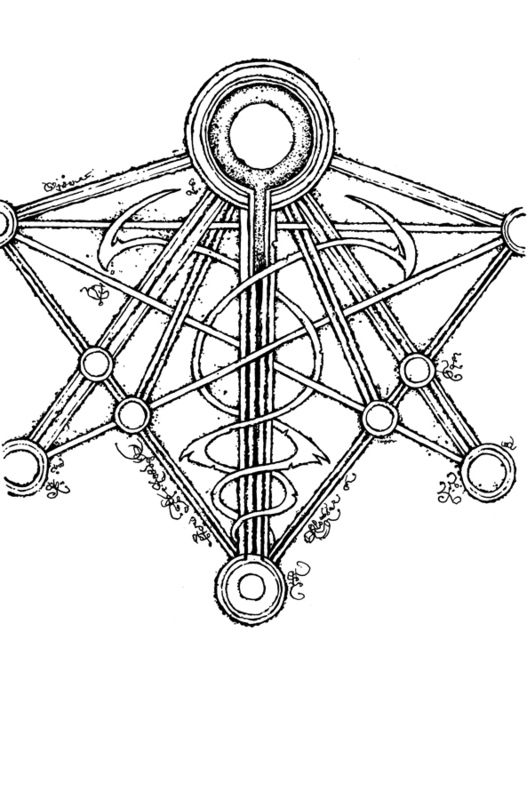 As the Dark Crystal characters demand, so much of the work is in the inking of textures. Some of their costume fabrics don't literally translate to linework, so I have to create patterns and texture to imply the same feel from the puppets to the drawing. I also inked the overlay pattern on a separate sheet of Strathmore bristol. While the linework here is black, I used photoshop tricks and techniques to make it lighter and ghostly in the final art. With the inks completed I scanned in the original and started flatting the color in Photoshop. 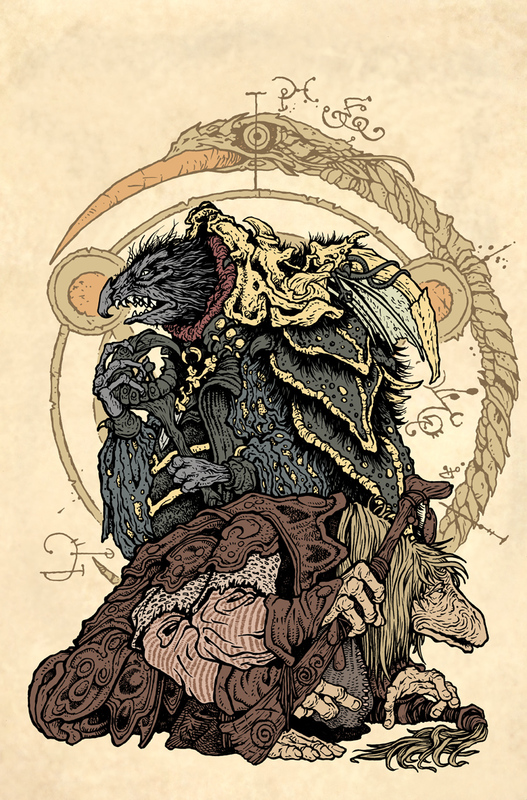 Flatting is the process of establishing color areas: that the Skeksis skin is a different color than the background or than the armor, or the mystic's hair or sleeves. It's basically digital professional coloring within the lines. The last step was to render all the color and to add color texture. I do all of that in Photoshop using the Dodge and Burn tools with a stock textured brush. So, that's 3 down and 9 more to go!!! As an annual tradition at the Baltimore Comic Con the organizers put together a 'Yearbook' typically celebrating a creator owned comic property that the guests of the show pay homage to with a piece of artwork. 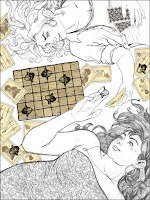 This year (the seventh year of the tradition) The work of Terry Moore (Strangers in Paradise, Echo, Rachel Rising, and Motor Girl) is the theme. 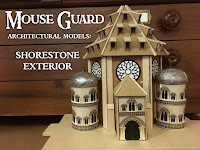 To the left you can see my finished piece of the main Strangers in Paradise characters playing the Mouse Guard board game Swords & Strongholds. Below I'll walk though the steps to create the piece. So, you may be as surprised as I was about the piece being human women. No animals in clothes, no creatures, no craggy dwarves...but pretty (I hope) ladies. I wanted to do Terry's characters justice and as they appear in his works...and I wanted to stretch my wings a bit and force myself out of my comfort zone....but again, I don't normally draw stuff like this...so I looked up reference. 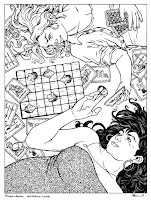 I had an idea to exemplify the romantic & friendship tension between the characters by having them play a board game or cards...I searched for 'women playing chess' and found this stock photo. I then reoriented the image so it fit the book's dimensions. On my lightpad I worked out the anatomy basing it on a printout of the stock photo...but I needed it to look right in my type of linework as well as for the features & clothes to look like Katchoo & Francine. 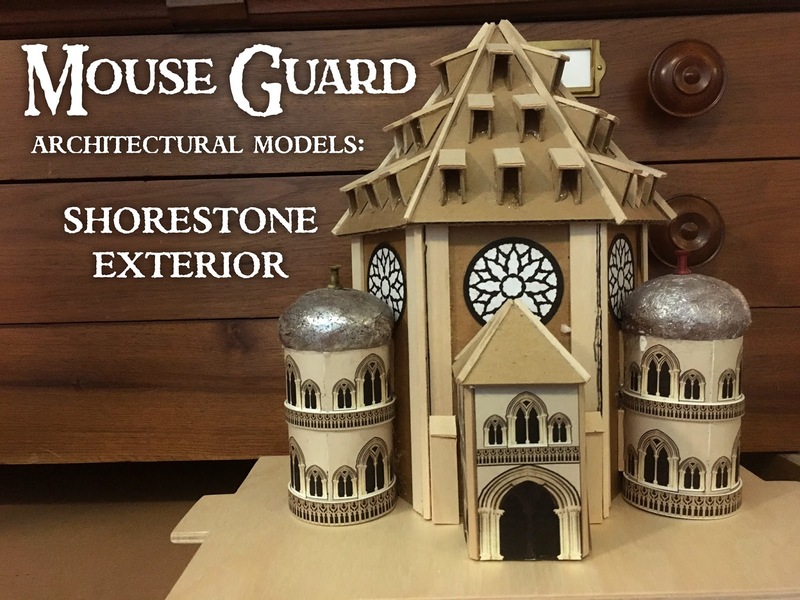 And to add in a bit of that Mouse Guard feel, I replaced the chess bits with Swords and Strongholds (and filled in some negative space with the cards strewn around). The Swords and strongholds bits look like finished artwork because I was able to paste in my digital files for the cards as well as the diagram from the instructions sheet for the game. 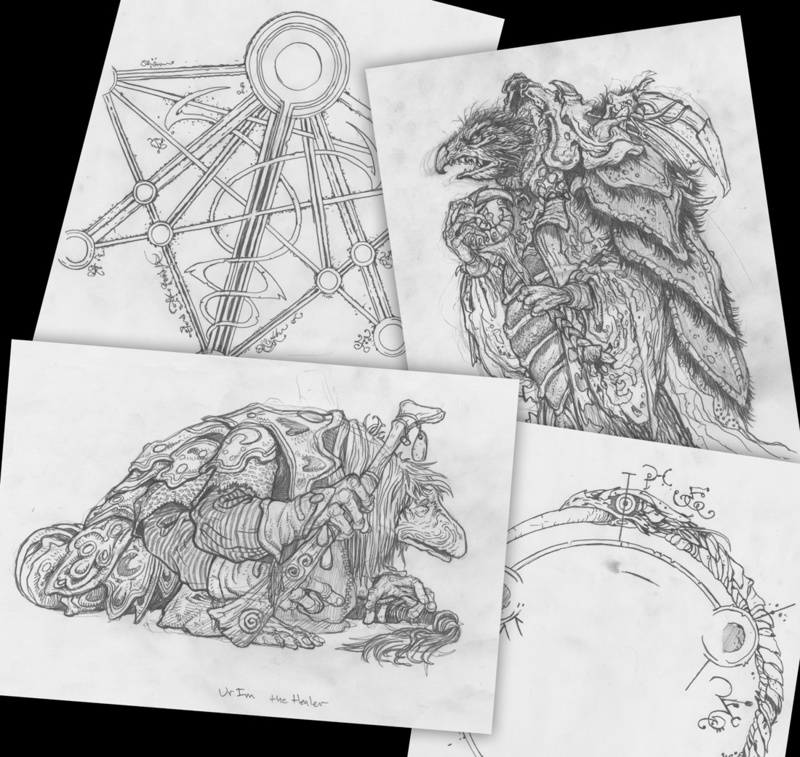 With a layout drawn and digitally composited together of Mouse Guard gaming components, it was time to start inking. I printed out the above layout and then taped that printout to the back of a sheet of Strathmore 300 series bristol. On my lightpad I can see through the surface of the bristol to the printout to use as a 'pencils' guide to ink from. I used Copic Multiliner pens (the 0.7 nib mostly) and added all the lineweight and texture I could to make the piece as 'David Petersen' as possible. Note: I did ink all the cards and board by hand instead of just digitally paste them in...this way the original art is complete (and will be up for auction at the convention) and the line quality/scale matches the rest of the piece, instead of looking like it was resized and digitally added. 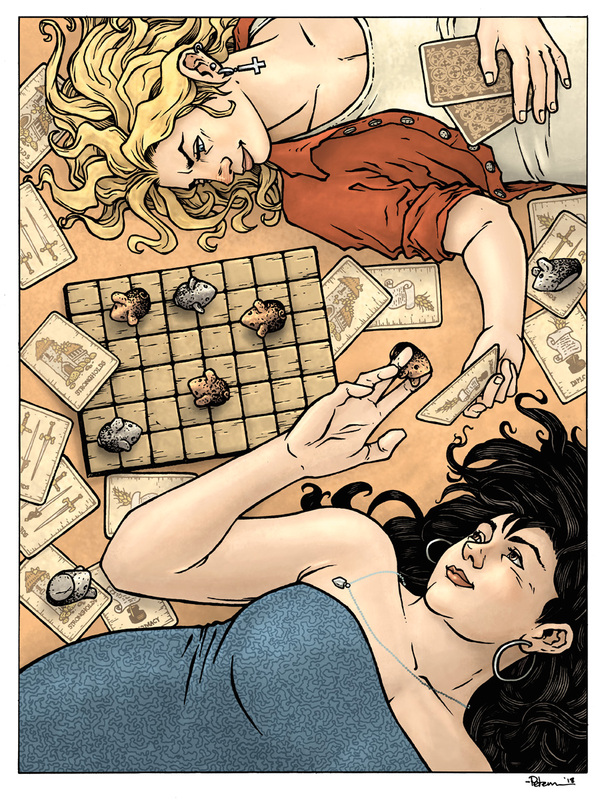 Once the inks were finished I scanned in the original art and started the coloring process by painting in flat colors. These flat colors help in the next step when I needed to isolate one area (like the floor or Francine's dress) and render it with light and shadow independently of the other areas. So, the flatting stage is basically digitally coloring inside the lines. I also established all the color holds here (areas where I wanted the lineart to be a color other than black) on Francine's dress & necklace, Katchoo's nose, and all the cards. The last step was to render the color fully and add shadow, highlight, and texture. I use Photoshop's Dodge and Burn tools with a stock textured brush to achieve this. The finished piece (seen to the right) will be one of many artist homages to Terry's work. The Baltimore Comic Con Yearbook will be for sale at the convention (and usually online from the convention afterwards) and as I mentioned above, the original art will be auctioned off on the Saturday of the convention.